The moment I scrolled to Zabby Allen’s post announcing her new magazine the Procrastination Paper, I knew I wanted to read it. I was trying to break the habit of automatically opening Instagram on public transport by taking a book, magazine or notebook with me. The Procrastination Paper’s mantra of ‘spend more time offline’ made so much sense to me. I find procrastinating offline is so much more fulfilling than online! Hi Zabby, tell me about how you started the Procrastination Paper? 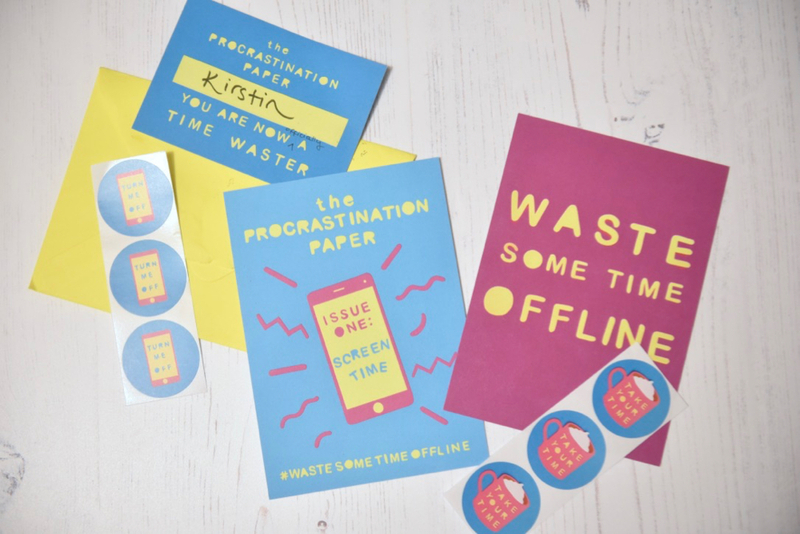 What inspired you to make an magazine about the importance of wasting time offline? I installed a time-tracking app on my phone in 2018 and was horrified to find that on some days I was spending over four hours staring at my phone. I realised that I was using work as an excuse for endlessly scrolling and watching people’s Instagram Stories and something had to change. I love that the magazine is small and slim enough to slip into my bag and read on the go, rather than reaching for my phone. Was that a conscious decision? Absolutely! I wanted it to be a tactile object that doesn’t feel too precious, so you can just chuck it in your bag along with your wallet and keys. That way it’s there as an alternative to your phone when you need a bit of procrastination time. I really hope people do scribble in the boxes that are there for writing lists or making notes and that they play the games in the centrefold. I imagined people reading it on their way to work on the bus or train and was so pleased to get a few photos from subscribers doing just that when they received issue one. How has the process of making an independent magazine? Did you have a background in it or any experience beforehand? I did Book Arts at uni and we learnt a little bit about magazines during the course so I’ve somehow managed to end up doing a job that’s relevant to my degree (something I never thought possible!) 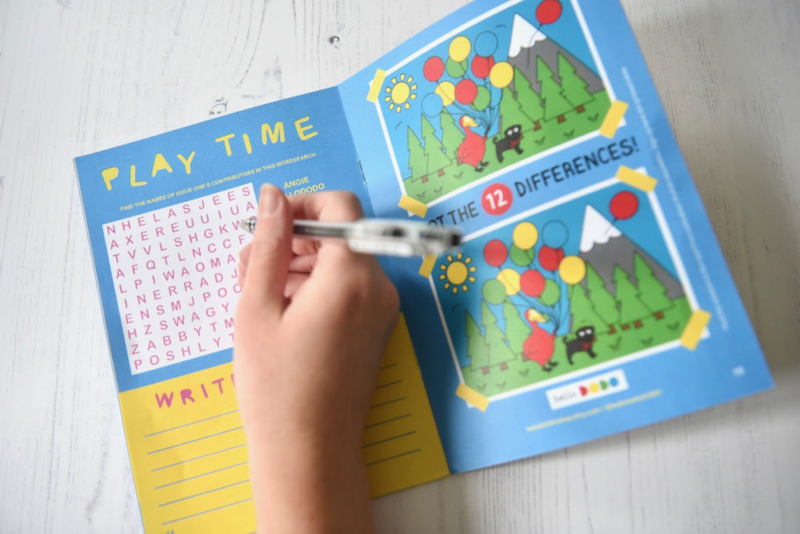 I also do some editing for other indie mags – Caboodle Magazine and The Happy Newspaper, so I knew I could ask Kayti [Peschke] and Emily [Coxhead] (who create those) for advice if I got really stuck on anything. 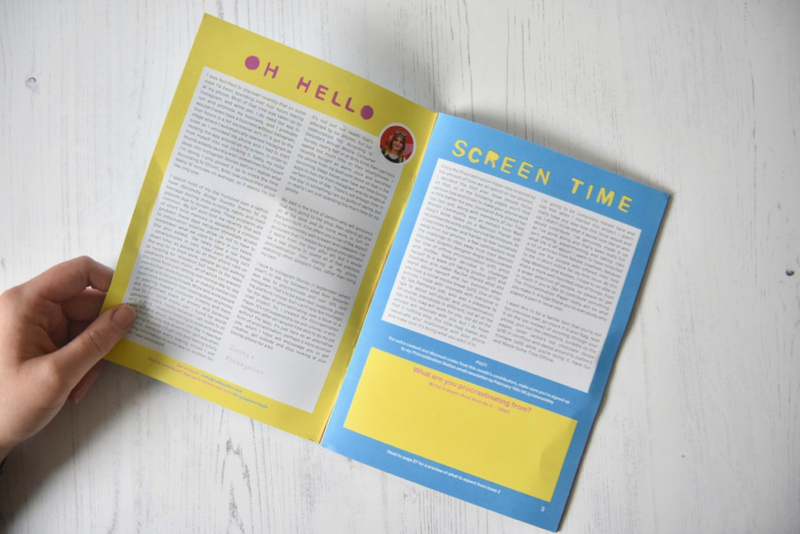 For almost 3 years I pulled together and edited a mini magazine for the Lucky Dip Club subscription boxes called Girl Planet. It was really working on that each week that made me realise I could totally create something similar for myself. So when Leona (the magazine’s founder) made the decision to shut down the business, I took that as a sign to start work on my own mag. I took a month off freelance work in September 2018 and just let myself sit with my ideas for a while. The original concept I had for my own publication was quite different to what became the Procrastination Paper, so I’m really glad I gave myself that time to let the ideas and inspiration flow naturally. What do you hope your readers get from reading the Procrastination Paper? I hope they feel satisfied by their procrastinating. If I realise I’ve been scrolling through Instagram for an hour I feel strangely guilty, but if I read my book or a magazine for an hour I feel much better about myself. I just want to put something in front of people that they will enjoy and that won’t make them feel bad about themselves. While it’s all about getting offline I’m not anti-phone or anti-Instagram at all, I bloody love my phone, and I’ve got a lot of work through the ‘gram, but I do hope that the mag makes people address the balance between their online and offline lives. What’s your vision or hope for your mini mag? My subscribers have already beaten my expectations and I’m so pleased to be sending the mag to people across Europe, as well as in Australia, New Zealand, America and Japan. I hope that I can continue to share untold stories, from a wide range of people. It’d be cool to see the mag in some independent shops down the line and I’d love to branch out into events, to bring people together offline. Lastly, what other independent magazines do you enjoy reading? 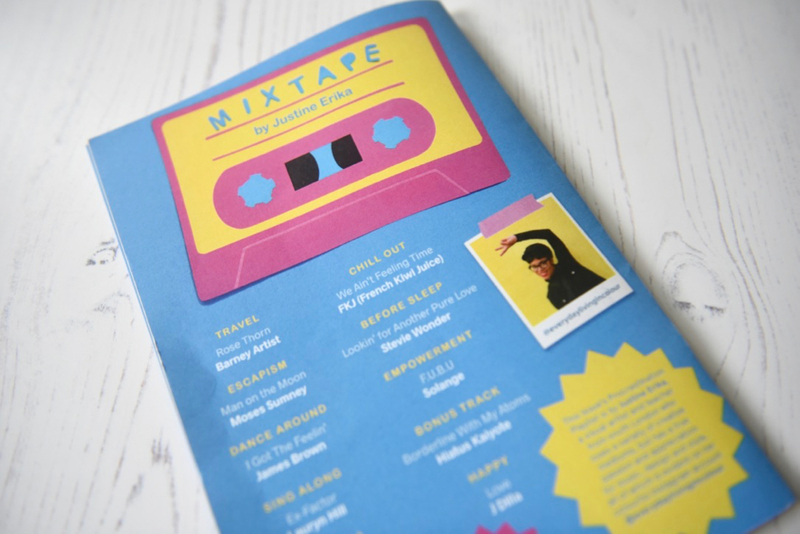 I might be biased, but I love Caboodle Magazine for the variety and the way it champions indie brands. The Happy News is obviously the most joyful news publication out there and I cry happy tears the whole way through editing. Illustrator Dulcimer Draws recently released her mag Sketch Appeal, which is like nothing else I’ve seen, really interactive and fun. I also enjoy a bit of Oh Comely, Frankie and the South East London journal, for a bit of local news! Thank you Zabby! 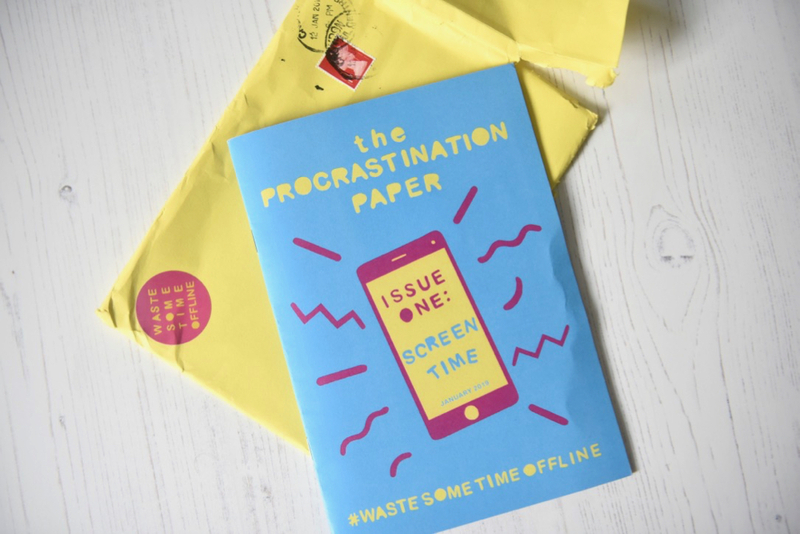 It’s fantastic to hear how well received issue one of the Procrastination Paper has been. I’m already looking forward to issue two and finding more fun ways to procrastinate offline! How can you buy independent magazines no matter where you are in the world?